I was in St Pat's at the time and at this show we placed 2nd behind St Lucy's and the point spreads between 1st and 4th were no more than 2 points as I recall. 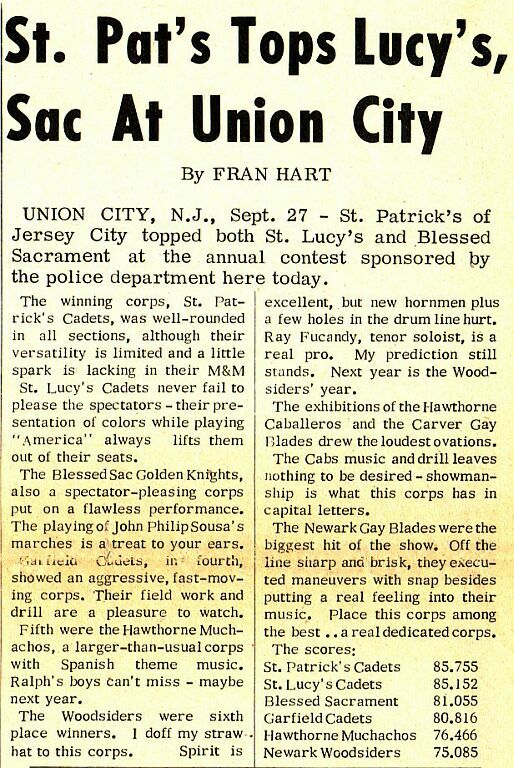 Loved Fran's 'lack of versatility' comment - he always had a thing for St Pat's in his writings - not sure why. At this specific show - St Pat's probably would have placed their usual 4th, but the drumline with a 4/4 line for the last 5 contests of the season was red hot. We took high in drumming exec by 2.5 points with the snare line only getting tagged for 2 tics. Memories. Forty seven years and I still remember how great that night was. It was years later that I found out about the silly politics and inside pool that went on with the judging of those contests. St. Pat's was never an inside player in all that so it was always "relegated" to also ran status. To finally win that night was an amazing feeling. Were we really that good or did the judges just finally throw us a bone? Doesn't really matter. A group of dedicated street kids got a boost they'd never forget.